Union County, Illinois’ annual Pepperfest AKA Festival de Chiles is quickly become an up-and-coming favorite gathering for chileheads and hot pepper fans throughout the Midwest, with some folks coming from as far as Washington, D.C. and Seattle, Washington. 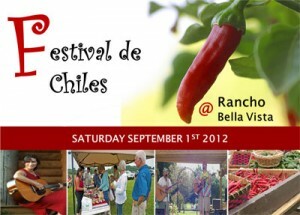 The event for 2012 will be held on September 1st from 11am – 5pm at Rancho Bella Vista, 825 Vines Rd, Cobden, IL. The festival will have all the Jim�nez clan working from sun up until sundown, picking chile peppers, making fresh salsa and homemade jams, jellies and processed chile pepper products, stringing up ristras, giving cooking classes, walking tours of the pepper fields to show folks the many varieties of hot pepper pods in bloom…Copyright 2011 ScottRobertsWeb.com.